I was born and raised in Clovis, CA. I was a gymnast for 10 years at Clovis Academy of Gymnastics & Dance. I competed in levels 4, 5, 6, & 7 and was training as a level 8. After gymnastics I went into diving and cheerleading. I was a competitive cheerleader in Junior High and High school, traveling and competing with an All Star team. I received a full ride scholarship for diving to CSU Fresno my freshman year. At the age of 16, I started coaching gymnastics at Clovis Academy. I loved every minute of it! It was my first job and remained my main job throughout high school and college. Some of my coaching was also at Alta Sierra Junior High and Clovis High School in Clovis. In 2002 I graduated from Fresno State with my BA in liberal Studies, moved away from my home town and got married. My husband, Jesse Wylie, is from Modesto, CA. So we made our home in Modesto. I received my CA teaching credential at CSU Stanislaus and taught first grade at Turlock Christen Elementary School for one year, then moved on to teaching fourth grade for two years at CF Brown Elementary school in the Sylvan District. During my time as a teacher I was able to coach diving at Johansen High School. In 2006 we had our first born, Brady. 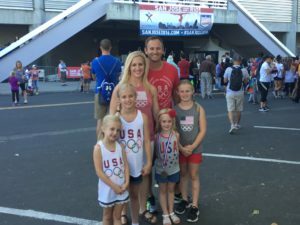 At that time, I became a stay at home mom and gave up coaching completely. We now have four daughters who all love gymnastics!! They are all currently taking classes at the USA Elite in Modesto. Brady is 11 yrs. old and competing in level 8, Jordan is 10 yrs. old and competing in level 7, Addison is 8 yrs. old and competing in level 4, and Tenley is 6 yrs. old and competing level 3. Three years ago I ran into Jim Trost, owner of USA Elite in Modesto, in Target. He is familiar with all my old gym coaches and told me whenever I was ready to start coaching again I would have a job. In a few months I was at his gym, registering my girls, and coaching a few nights a week. As time progressed, I began coaching a “Mommy & Me” class once a week and then in May of 2015 I was coaching four nights a week. I’ve been coaching the team girls, levels 2, 3, 4, 6, 7 & 8 for the last three years along with some toddler classes. I am currently USAG certified which gives me the ability to be out on the floor coaching the girls at meets. I am still one of the competitive team coaches at the Modesto gym as I teach classes in Oakdale. I am learning more and more every day and at every meet I go too. Gymnastics has been a part of my life since I was two years old. It has gotten me where I am today. I have learned what it means to be an athlete, to have discipline and commitment, and the ability to survive in almost any situation that comes my way. The Lord has given me the abilities to coach. I love seeing children learn and achieve their goals! Our family is excited to become a part of your family! We look forward to the years ahead with you!